Cecilia Kay Nicté Chablé Berlín became a GOJoven Fellow when she was 23-years old. 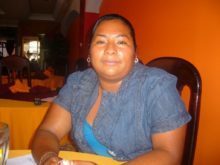 Her professional experience includes working as a teacher and providing technical support at the Intercultural Maya University in Quintana Roo. She holds a Bachelor’s degree in Preschool Education, and Certification in Creating Intercultural Environments. Her short-term goal is to increase her abilities as an effective teacher, especially pertaining to intercultural education. In the long-term, she aims to be a specialized teacher in pedagogy and intercultural education that participates actively in the development of professionals to contribute effectively to community development efforts.